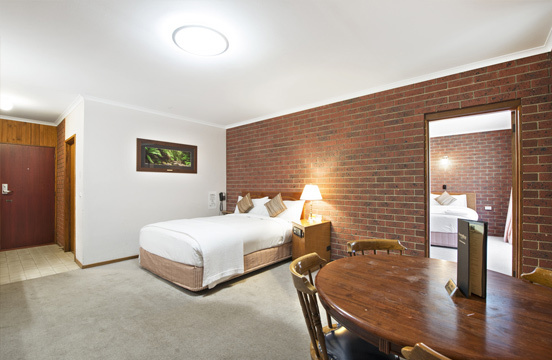 An older style room with a Queen bed in the main room and 3 King Single beds in the second room. An older style room with a Queen bed in the main room and 3 King Single beds in the second room. This unit is fully non smoking, on the ground floor and is located at the top end of the property along Grampians Road. It has an electronic door lock, a wardrobe, spare pillows, a desk, a couple of chairs and has a private bathroom with shower facilities and a toilet which is accessible through the main room. It also has tea and coffee making facilities, reverse-cycle air-conditioning in both rooms, electric blankets, flat screen television in both rooms, DVD player, in-room safe, iron and ironing board and a mini bar. You would choose this option if you are a family with children but do not want to be stuck in the same room with them.